April 6, 2016 – One of our favorites for all levels of riders. Great in the park for the advanced rider and perfect stiffness for a beginner. The Rossignol Retox rides 2 to 4 centimeters longer than it really is, so stability is one of the areas it excels. 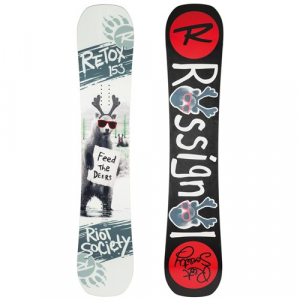 The Rossignol Retox Amptek Snowboard is a true-twin powerhouse built for pure park pandemonium. The stiffer, ultra-blunt tip and tail provide monstrous pop and smooth swing weight, while AmpTek Freestyle enhances stability at high speed to set-your-spin and stomp the biggest hits in the park, so you never come up short. A single type of wood that`s vertically laminated to give you durability and comfort without breaking the bank. Delivers customized flex with increased torsional resistance and stability.